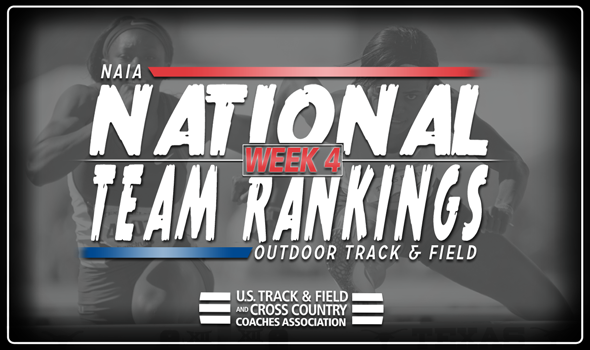 NEW ORLEANS – Numerous changes befell the NAIA Outdoor Track & Field National Team Rankings over the course of the past week. The most recent rankings released Wednesday by the U.S. Track & Field and Cross Country Coaches Association (USTFCCCA) saw 24 of the top-25 men’s teams and 16 of the top-25 women’s teams shift spots between Week 3 and Week 4. Indiana Tech is back in a familiar spot in the men’s rankings. The Warriors once again reside at the top as they jumped now second-ranked Wiley (Texas). Indiana Tech used a quartet of strong marks from this past weekend to make this happen as Justin McKenzie is now ranked No. 2 in the pole vault, the 4×100 relay team is now billed third, Luke Runyan is now ranked No. 4 in the 1500 and Barthelemy Peter is now No. 6 in the 400. Central Christian (Kan.) jumped two spots to take over the No. 3 spot. The Tigers own six marks on the Descending Order List that are ranked in the top-3. Keiser (Fla.) is billed fourth in the rankings, large in part to the success of Chris Grinley. The sophomore hurdler is ranked first nationally in the 110 hurdles at 13.94 and third nationally in the 400 hurdles at 53.22. Hastings (Neb.) is ranked fifth. The Broncos roll deep in the field events as six of their seven top-10 marks nationally are in those disciplines. Indiana Tech and Wayland Baptist remained No. 1 and No. 2 in the women’s rankings, but Southern-New Orleans (La.) is making some noise. The Knights closed the gap between themselves and the top-2 teams thanks to some strong outings this past weekend. SUNO saw Argyana Bolton take over the top spot nationally in the 200, as did the 4×400 relay. Other impressive performances belonged to the 4×100 relay team (now ranked second) and Shantae Green in the 400 hurdles (now ranked fifth). Hastings (Neb.) fell to No. 4 and Friends (Kan.) continues to round out the top-5. The biggest jump in either of the rankings this week belonged to the women of Aquinas (Mich.) as they went from No. 44 to No. 15.